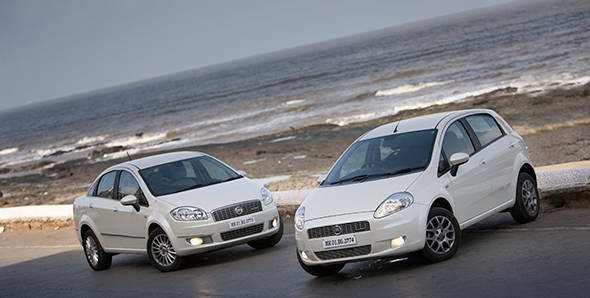 Fiat has big plans for India in 2013 but they've kicked things off in a relatively small way with the launch of the 2013 Linea and Punto. Both cars get a slight refresh with a few changes and added features here and there to keep things up to date. Mechanically the cars remain identical and the same variants are on offer as before. The Punto gets a new shade of Vocal white that replaces the old Bossa Nova white  a very subtle change that you won't really notice much. What's slightly easier to notice is the new gun metal grey shade on the Punto 90's alloys. The Active, Dynamic and Emotion Puntos get fresh grey seat upholstery while the 90PS variants continue with the black theme. The 90PS variant also gets sporty red stitching on the steering wheel. The final visual tweak is some chrome garnishing on the door handles and in the airvent knobs. The Linea also gets the new shade of white while the lower Active and Dynamic variants also get a new beige interior. The top Emotion continues with its leather upholstery. Both the Linea and Punto get a remote control for the Blue&Me enabled sound systems. Fiat also offers a manual sun visor for the rear windscreen on the Linea. That about wraps up the changes for both cars but while Fiat is claiming no mechanical changes we did find that the long travel clutch on both cars had a slightly lighter action. This makes driving around town and clutch modulation in traffic an easier affair. Fiat boasts that the Linea has 185mm of ground clearance while the Punto is an SUV rivaling 195mm above the ground. While the cars do look a little ungainly the high clearance makes them quite practical on our roads. And since all the engines are below 1.5-litres the cars avoid being classified as SUVs under our harebrained new vehicle classification norms. Prices remain the same for both cars with the Punto is priced between Rs 5.2 and 7.6 lakhs while the Linea's price ranges between Rs 7.3 and 9.8 lakh ex Mumbai. Fiat will re-launch the Linea T-Jet next month and this time it will be available in a number of variants to make it more accessible to the buyer. Fait had stopped sales of the top of the line turbo petrol powered T-Jet because the sales numbers were too small. On a separate note, Fiat India has also set up mega free checkup camps in Mumbai, Surat and Pune. This three day camp starts on May 17 and ends on 19. All participating Fiat cars will be given a free wash, 10 per cent discount on accessories and car parts as also 20 per cent discount on labour. Fiat customers will be contacted through text messages and emails about these camps in their cities. While Fiats own products may not have seen much change this is the start of very big things for the company. The Abarth cars are on the way but even bigger news is that the Jeeps are almost here. And you can read all about them in OVERDRIVE sooner than you think.